A large indoor pool is an important part of many luxury properties and the financial investment is seen to return dividends in terms of health, lifestyle and the value of the property itself. However, the pool room is usually the largest space in the house or on the property and although there is a great deal of enjoyment that can be had from the pool itself there can be disadvantages to having so many square feet dedicated to one particular activity particularly in urban areas where space for everyone is at a premium. What if, at the touch of a button, that pool could become a games room or dining space? Conversely, what if you could make a full-size pool appear in the middle of a ballroom? How to walk – or dance – on water. A moveable pool floor is designed to reclaim the surface area of a pool when it is not in use. The only sign that a close inspection might reveal is that the tiled or stone surface of the pool section of the room’s floor has un-grouted joints. At the touch of the button, a section of the floor begins to sink and after it has lowered by a few inches, water begins to emerge across the surface of the moving section. 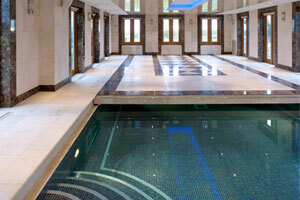 The floor sinks down into the water revealing the already full and heated pool. The floor can stop its travel and be held at a number of pre-selected depths. For instance, as a child’s paddling pool, a wading depth for aqua fitness or the full pool depth. The floor need not even remain flat and so it would be possible to have a deep and shallow end or pool steps. Reclaimed space and reclaimed costs. Aside from the pool area gaining another usage as a party space, large dinning area or games room, there are other advantages when the floor is raised. As the floor is locked securely into position, the pool becomes completely inaccessible to children, animals and others and so completely safe. The raised pool floor provides insulation so that when not in use, heating costs are significantly reduced and evaporation is limited so reducing the need for chemicals and water treatments. Moving floor pools will almost always be indoors, possibly even underground, and so lighting is a key component of their design. EVA Optic produce a range of high quality LED lighting solutions that will work just as effectively when the pool is in use as when the space is being used for another purpose. In fact, one of their particular qualities is the ability to match underwater lighting effects with ambient lighting in the rest of the space.